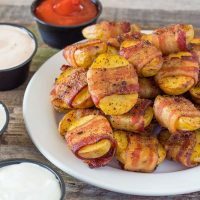 Bite-sized bacon baby wrapped potatoes with bonus Sriracha Sour Cream Dip recipe are the perfect snack for football, holiday gatherings, or just hanging out at home having a lazy weekend watching TV. 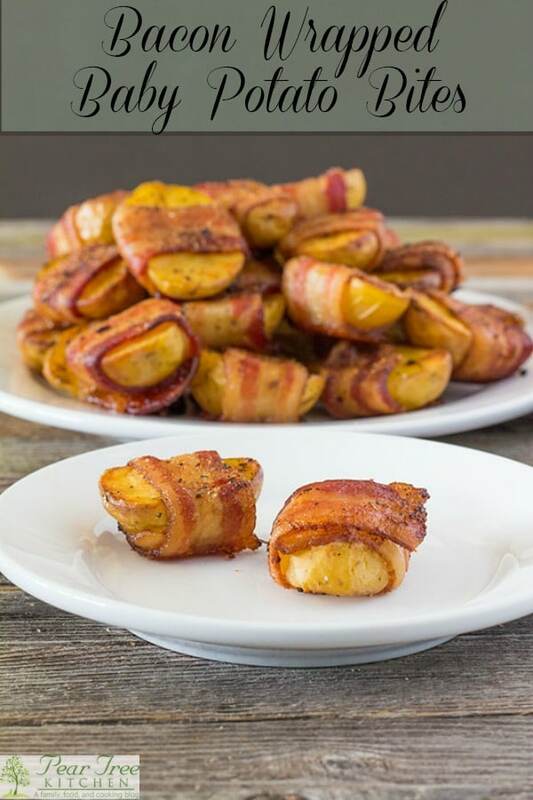 I like to use baby yellow potatoes for Bacon Wrapped Baby Potato Bites, but any small potato will work. 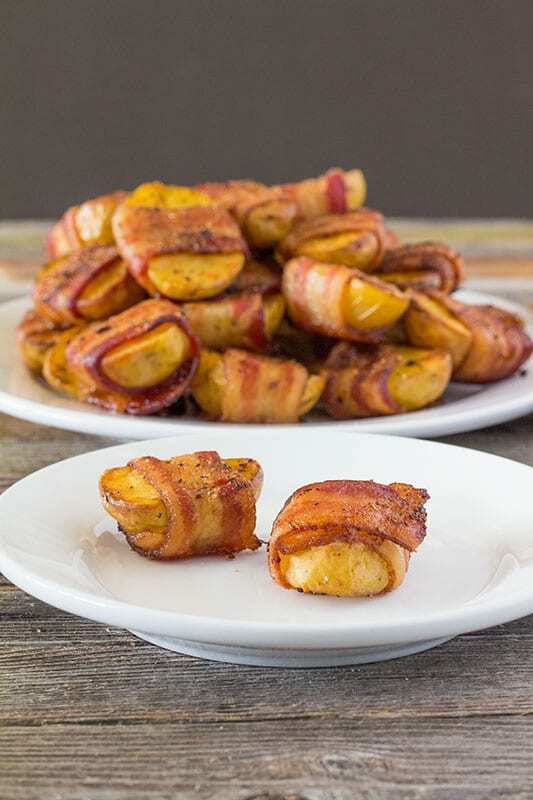 Before baby potatoes were available year-round and reasonably priced, I made Bacon Wrapped Potatoes out of regular sized potatoes, they just need to be cut into wedges. If season pepper is not spicy enough for you, Sriracha sour cream on the side will bring a little more heat to your game. These are also good with plain sour cream, sour cream seasoned with season salt and season pepper, or just plain ketchup. I usually serve all of these, giving choices for every taste preference from plain Jane all the way to set your mouth on fire. Whenever I am mixing my sour cream dip up, I make it in mild, medium, and set your soul-on-fire levels. You could even just set the Sriracha sauce on the table and let folks mix up their own sour cream dip recipe. I parboil my potatoes before wrapping in bacon and putting in the oven. This is not necessary, but it avoids overcooked bacon and under-cooked potatoes. It can be trying sometimes to get the best of both worlds, so parboiling the potatoes fixes this problem. If you are using larger potatoes cut into wedges, I suggest parboiling the whole potato and then cutting into wedges. Boiling a whole potato first before cutting the potatoes into wedges prevents the thin portion of the wedges from falling apart. Feel free to use thick sliced bacon if you like, it will take longer to cook and may never get as crispy as thin bacon. But hey, some people don’t like crispy bacon and I won’t judge, I prefer my bacon kind of flabby at breakfast. These can be served hot or at room temperature, making them a great choice for parties. 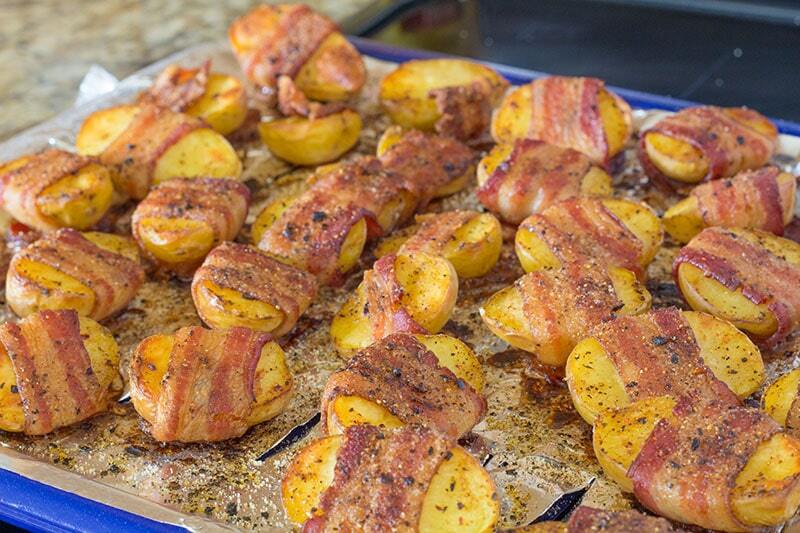 If you want to use tater tots for your bacon wrapped potatoes, that will be fine too. I would give my bacon wrapped tater tots a few more minutes in the oven though to make sure that they aren’t still frozen in the middle. 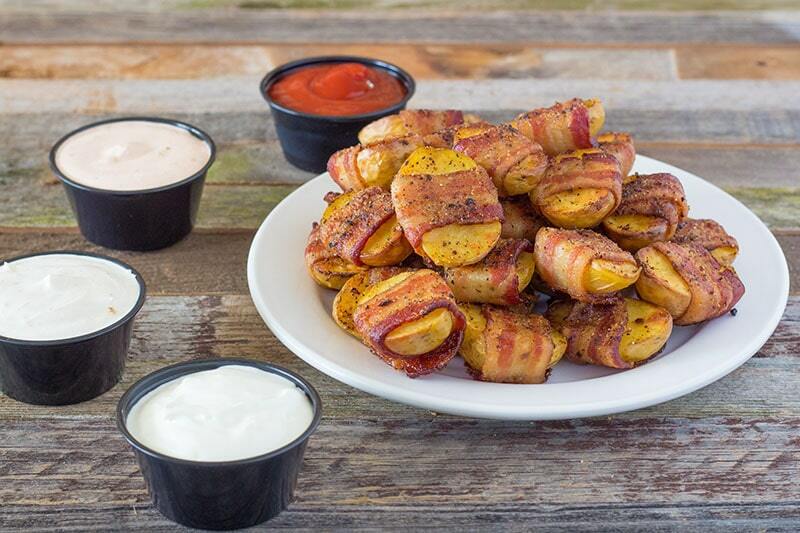 Spicy Baked Potato Bites wrapped in bacon served with a spicy sour cream. Bring a large pot of water to a boil over medium-high to high heat. Reduce heat to keep water at a low boil. Add unpeeled potatoes to the pot and cook for 10 minutes. While potatoes are boiling, prepare a baking sheet by spraying with baking spray. Alternatively, place aluminum foil on the top of a broiler pan. Cut slits in aluminum foil to allow grease to flow into the lower portion of the broiler pan. Spray aluminum foil with baking spray. Set pan aside. Drain water from potatoes and allow potatoes to cool. Once potatoes are cool enough to handle, cut each potato in half. Sprinkle potatoes with season salt and season pepper. Cut bacon slices in half, forming 2 short pieces per slice of bacon. Wrap each potato half with bacon, stretching slightly if necessary. Toothpicks can be used to hold the bacon in place, but I find I can just wrap them and place them on the pan with the seam side down. Place potatoes into the preheated oven and bake for 45 to 60 minutes or until bacon is cooked to desired doneness. To make Sriracha sour cream, add 1/2 cup sour cream to a bowl and add Sriracha sauce, start with 1 teaspoon and gradually add more until the desired level of heat is reached. Sour cream mixed with season salt and season pepper can also be used for dipping. Nutritional information provided may vary by the nutritional calculator. Please re-check information in the calculator of choice if vital dietary restrictions apply. Calorie count provided does not include optional dipping sauces. I have to admit, these are hard to share! Bacon, potatoes, bliss. These are total perfection! I’d say they’re perfect for parties, but I’m not sure I’d be able to share them! Love love love!